U.S. Rep. Steve King (R-IA) speaks during a hearing before the House Judiciary Committee June 28, 2018 on Capitol Hill in Washington, DC. 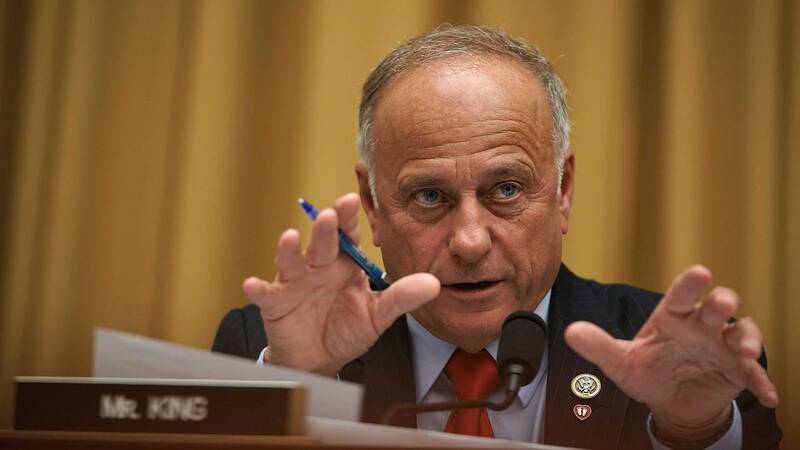 (CNN) - Rep. Jim Clyburn, the number three Democrat in the House, introduced Monday a resolution disapproving of Iowa Rep. Steve King's recent racist comments, calling it a "condemnation of white supremacy and white nationalism." Clyburn's motion does not censure King, as some Democrats -- including Tim Ryan of Ohio and Bobby Rush of Illinois -- have called for. The House could vote as soon as Tuesday on the resolution, Democratic sources tell CNN. Republicans including Senate Majority Leader Mitch McConnell and House Minority Leader Kevin McCarthy, who met with King Monday, have denounced him. "So today I denounce the words of Rep. Steve King and I do so invoking the words of another king, Dr. Martin Luther King Jr, who if would have been allowed to live, would be celebrating his 90th birthday tomorrow," Clyburn said on the House floor. "Dr. King counseled that we are going to be made to repent, not just with the hateful words and deeds of bad people but for the appalling silence of good people.'" Clyburn continued, "I call on my colleagues on both sides of the aisle to join me in breaking the deafening silence and letting our resounding condemnation be heard." While King has a history of incendiary comments related to race and immigration, it was only after a recent interview in The New York Times that lawmakers from both parties have come out so strongly against him. In the interview published last week, King said, "White nationalist, white supremacist, Western civilization — how did that language become offensive?" King has since said that he is not a white supremacist or a white nationalist. In a press release, King wrote, "I want to make one thing abundantly clear: I reject those labels and the evil ideology they define." He said he is "simply a nationalist." On Monday, King declined to further comment.